Description: The Southeast College ID Camp (and Goalkeeper Academy) is a fast paced and challenging 3 day destination camp with sessions designed for players to improve on their individual technical ability as well as their tactical understanding while also showcasing in 1 to 1 environment with college coaches. Our training sessions are created to allow players to get a taste of what it is like to compete in a college like training environment while competing with elite players across the country. In addition to daily training sessions, we have evening 11v11 games to give players the opportunity to apply what they have learned and showcase themselves in front of various college coaches. Please email us if you are interested in the rate code. Camp is open to any and all entrants (limited only by number, age, grade level and/or gender). 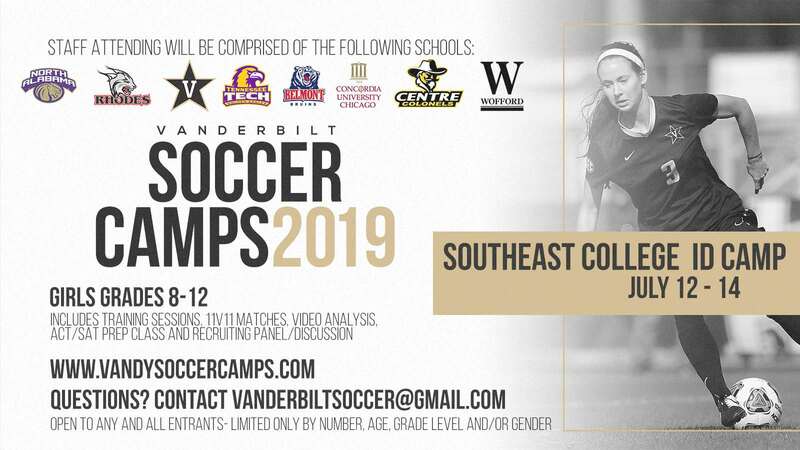 *Vandy Soccer Camps cannot guarantee all coaches listed will be able to attend all the sessions. Summer Camp Refund Policy: Upon Registration - There is a $50 non-refundable fee. If you cancel within 7 days before the camp start date or are a no show - there will be no refund with no exceptions. Summer Camp Cancellation Refund Policy: In the event that a summer camp is cancelled due to inclement weather or other unanticipated circumstances, participants will receive a full refund for the camp registration fees. Vanderbilt University is not responsible for any expenses accrued in relation to the camp. ID Clinic Transfer Policy: Upon Registration - You are allowed one transfer if you are unable to attend an ID camp. The transfer must be made before the date of the ID camp that you originally registered for. If you are a no show the day of the ID camp you forfeit your ability to transfer - NO exceptions.